A couple of weeks ago I put together this simple pumpkin banner for Fall. 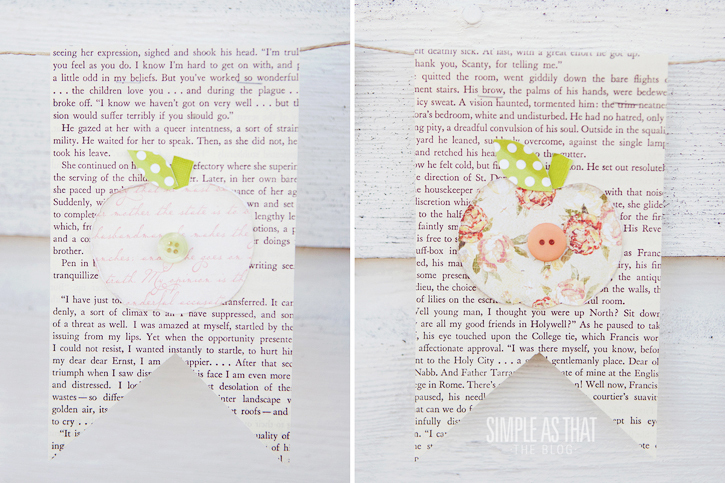 I just can’t seem to get enough of these simple book page buntings! Pretty soon I’ll have one for every season! They’re so quick and easy to put together and add just the right handmade touch to our holiday decor. 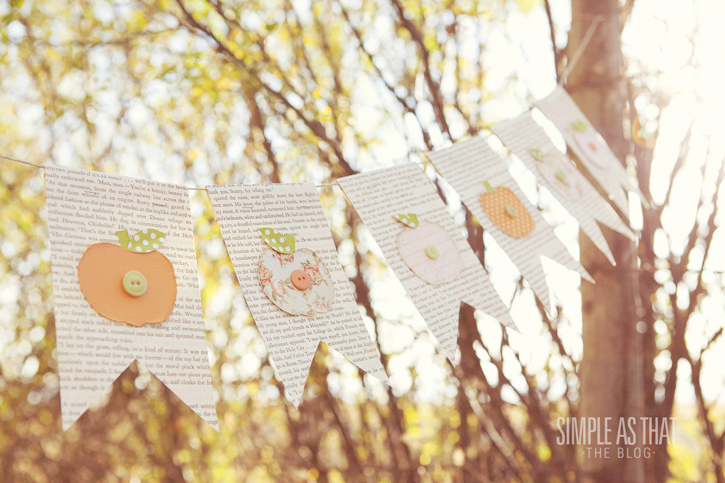 Scroll down for a supply list and instructions on how to create your own pumpkin bunting! 1. Using your book pages cut out however many rectangles you’d like approximately 3.5″ x 6″ in size. 2. Snip out a triangle shape from the bottom of your rectangles. Hint: From left to right, find the center of your rectangle then measure approximately 1 3/4 ” from the bottom to find where the top point of your triangle will be. 3. 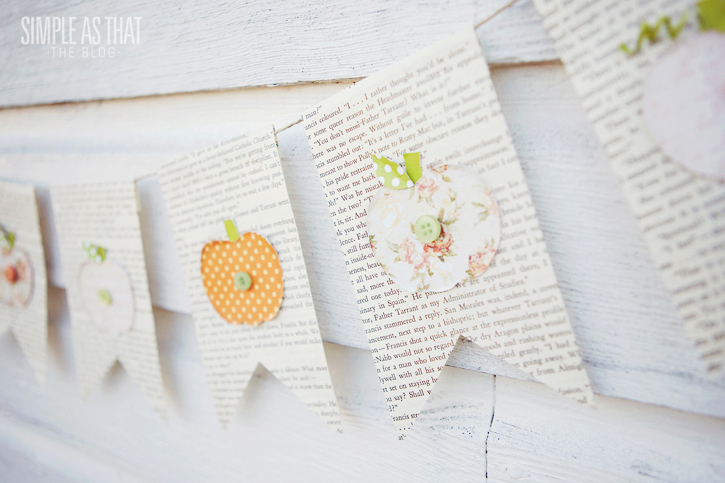 Cut out the number of pumpkins you’ll need for each piece of your bunting. 4. 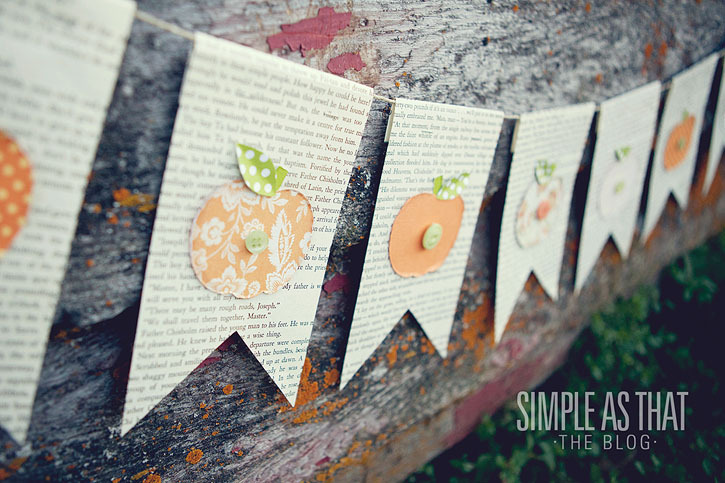 Attach pumpkins to your bunting pieces being sure to allow enough room to fold over the top edges. Place a button in the center of each pumpkin. I also added a small leaf to some of my pumpkins. 5. Now you’re ready to put your bunting together. Simply cut a length of string and attach banner pieces to string by folding top edge of banner pieces over the string + staple. Space banner pieces evenly along the string by sliding them back and forth as needed. 6. Now hang that cutie up somewhere and enjoy your new Fall/Halloween decor! 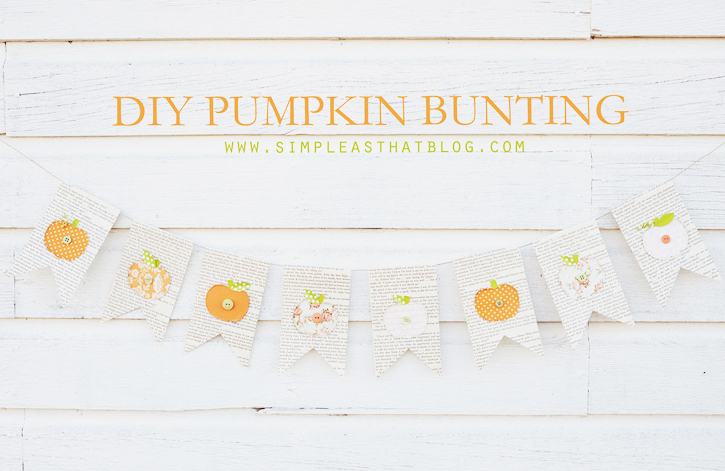 I hope you enjoy our little pumpkin bunting as much as I do! It was a lot of fun to put together and looks so darling hanging up in my home office! It’s so helpful to know what projects you like so I can keep on sharing more tutorials and craft ideas that you enjoy! If anyone is looking for cheap books to use for projects like this, Target usually has paperback young adult classics in their dollar spot section…then you don’t have to feel guilty about tearing up an old book. For cheap “old” books, the dollar spot section at Target usually has paperback young adult classics for $1. Thanks for sharing this idea. I love anything made with book pages. Very cute! It would be fun to use it to decorate a dessert table. Very cute idea! I am getting lots of fun ideas from the internet this season. I am not very crafty but I think even I could do this, thanks for the idea! These are adorable, Rebecca! I found your blog when I was doing an image search for a Valentine’s Day bunting back in January and I’m so glad I did. Simple As That is one of my very favorite blogs! At any rate, I’m with you about having a bunting for every season…I’ve done a Valentine’s, St. Patrick’s, 4th of July, Autumn…can’t wait to see what you do for Christmas. Thanks for ALL the inspiration! This is adorbale, love your creations! adorable!!! I pinned it. Plan to do this with my card making club!! O this is so cute! Rebecca — I’ve written before about how much I loved your St. Patrick’s version of this book bunting, and how it inspired a fall version at my house. This version with the patterned pumpkins is just as sweet! LOVE IT! Love love LOVE this bunting!! Thanks for sharing! I love all your crafts! Now whether or not I get out there and re-do them is another story ;). I’m not a natural crafter! Very cute! I love bunting ideas. 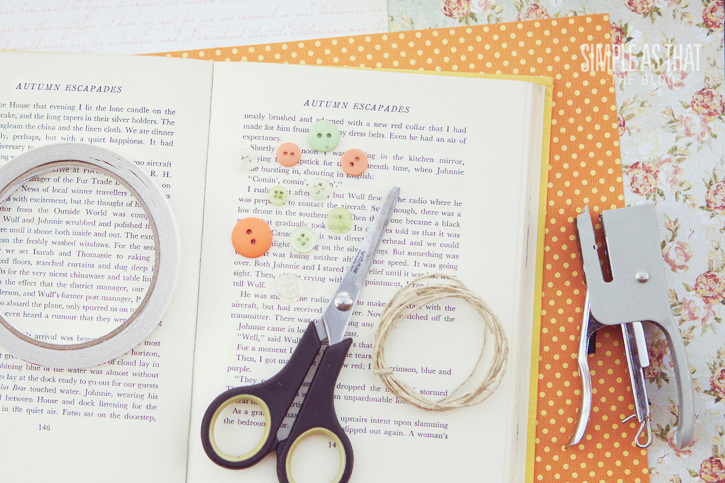 They are simple enough that I can get my little ones to join in the crafting fun. I think a bunting for every season is a great idea! We tried your bat one as well 🙂 I used newspaper since I didn’t have a book handy…a book would work better since the paper is thicker. Thanks for sharing! I love this! I’ve been looking for something to do with all the crummy books I got from the dollar store. This is perfect! Thanks for the tutorial. so sweet and easy to do! Wow this is great. My two year old and I are working on the leaves one today :). Thanks for the idea! Thank so much Rebecca! I used your DIY Pumpkin bunting for a little mini quilt ; you can see it on my blog http://saltedriver.blogspot.fr/ and on Flickr too if I succeed uploading… Have a nice creative week! Thanks from France! awesome tutorial! thanks for the creative idea! Love this idea! What did you use to create the shape of the pumpkin? TY!